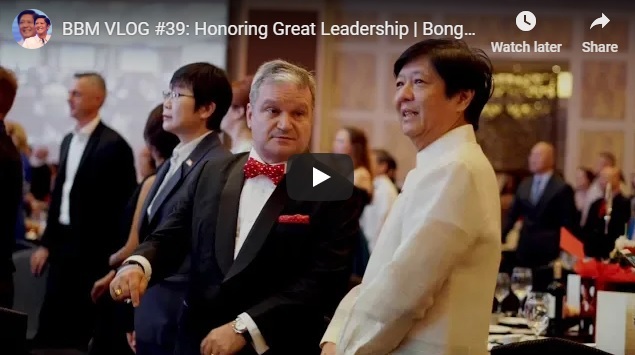 See Bongbong Marcos’ Leadership Goals and Who is He Missing? Bongbong Marcos is grateful to the invitation of USEC Jun Santiago for inviting him to the highest award of the land night for the late Senator Miriam Defensor Santiago. President Rodrigo Du30 bestows the Quezon Service Cross award to her recently. Her husband receives it on her behalf. Marcos mesmerizes on the signs of the blinding intellect behind her humor. BBM expresses how he misses his running mate during the 2016 election. Prior to that, he also reminds the youth of the leadership goals that matter for the country. [VIDEO]: The brand of leadership and intellect that the late Sen. Miriam Defensor Santiago has showed us continues to inspire our youth and our next generation of leaders. Madam Senator, you are well missed. The Quezon Service Cross is unique in that the President nominates Filipino citizens for the award. The Congress approves its conferment. Santiago’s widower, Narciso or Jun, accepts the posthumous award. He thanks the President for it. The first five recipients of the Quezon Service Cross since its creation in 1946 include Emilio Aguinaldo and Carlos P. Romulo. Ramon Magsaysay, Benigno Aquino Jr., and Jesse Robredo follow suit. NYC Chairperson and Chief Executive Officer, Undersecretary Ronald Gian Cardema invites Marcos during the recent SK National Conference in Baguio. He reminds the youth that he is the author principal author of the who creates the Philippine Youth Commission that is now the NYC. Gov. Imee Marcos showers the young attendees with funny speeches that Bongbong Marcos likens to Vice Ganda’s comedy stunts. The crowd was obviously hysterical, said Marcos. Notes had it that her chance encounter with the latter becomes an issue to some. Marcos also had fun with the Consular Ball of Estonia for the Christmas season. The diplomatic corps’ members attend the event. A rare chance for them to let their hair down without having to deal with the state’s affairs. Afterall, work-life balance is crucial to all. The VP Protestee also warns the SK leaders to not tolerate dirty elections. That whatever they experience and see in previous elections, they won’t embrace such anomalies found. Marcos certainly imparts his leadership goals to these youths who can lead the country in the future.